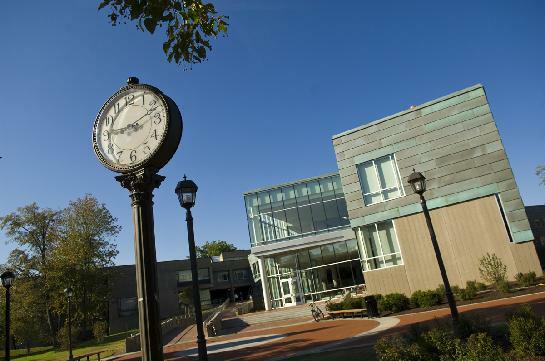 Hamilton College, a small selective liberal arts institution in Clinton, New York, has expanded its Social Science program. This includes the complete renovation of the existing, 1968, Kirner Johnson Building in the Spring of 2009, as well as the recently completed 35,000 square foot addition in the Fall of 2008. The new 4,000 square foot “commons” brings together a mix of classrooms, offices and informal meeting spaces while highlighting the Center for Public Policy, the Writing Center and the Center for Oral Communications. The renovation and addition is structured around the integration and interaction of students and faculty. Centralized departmental offices are surrounded by a mixture of classrooms varying in size and shape while faculty offices are located to provide easier student/faculty interaction. The new main building entrance and commons space is located on axis with the main path of travel, known as “Martin’s Way, which connects Hamilton’s historic North Campus with the 1968 South Campus designed by Ben Thompson. The transparency of the new glass and steel addition is designed to offer an aesthetic counterpoint to the classic “Brutalist” style of the original building. Hamilton employs numerous green strategies including the use of native vegetation to minimize irrigation demands, and the retention and natural filtration of storm water. The narrow building addition provides daylight in virtually all spaces including the commons area which is used daily for informal teaching and after hours student interaction. The building includes excellent window and wall assemblies to help control heat gain and loss as well as provide a comfortable working space. Water efficient plumbing fixtures, efficient mechanical systems and the use of non-toxic, environmental friendly materials and finishes are used throughout. This is Hamilton’s second building to follow the LEED protocol, and will be the first to receive LEED Gold Certification.